Emerald Enchantress and her Fatal Five partners Selena, Indigo, Magog and Solomon Grundy have been attacking Supergirl, the D.E.O. sites known as the Blade and the Scabbard, CatCo and National City believing Supergirl's future self may be a danger to their timeline. They could well be right, for Kara Zor-El was shot by a beam that overcharged her powers, making her lose control of them. If she doesn't find a way to contain her abilities and defeat the Fatal Five, the entire world may be destroyed by the Lost Daughter of Krypton. Shay Veritas has managed to perform surgery that allows Kara to control her powers even if they increase. However, thanks to leaked security footage, everyone in National City knows that her father, the Cyborg Superman, is being held in the Blade in hopes that he can be saved. This does not sit well with the people. Meanwhile, Emerald Empress reveals that her father dies during a future battle with Supergirl. In the meantime, Lar-On (the Kryptonian werewolf) is defending the Scabbard's perimeter against Magog and Selena while Jeremiah and Eliza Danvers try to find other D.E.O. assistance inside. To top things off, Cat Grant and Ben Rubel must try to get into the securely sealed CatCo. The fate of the world and the future could depend on all of their success. Emerald Empress has found Zor-El. Now, in what she considers poetic justice, she wants Supergirl to watch her father die as the empress' Emerald Eye of Ekron is poised to blast the dormant form of the Cyborg Superman. Will Kara save her father and National City all while she rescues her own reputation? 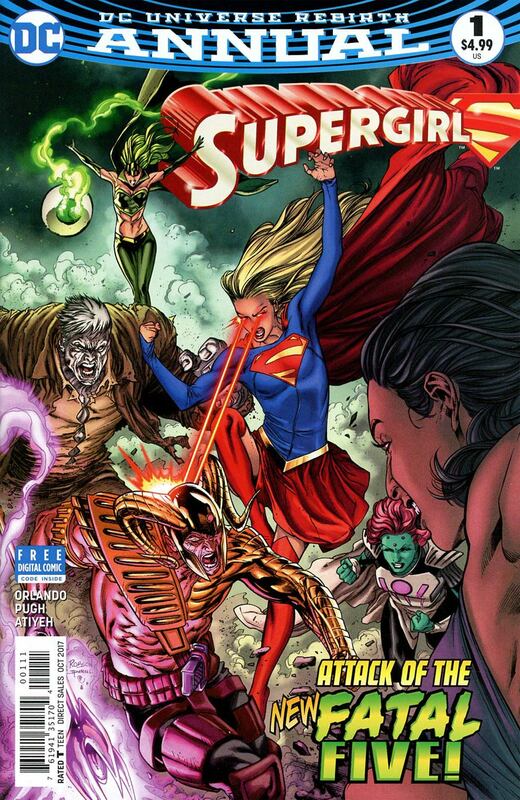 Will the Emerald Empress succeed in destroying the Girl of Steel to prevent her future from coming to pass? Story - 4: While this does merit a perfect score, it seems like what was intended for two monthly issues got crammed into an Annual. Perhaps if the Annual had begun or ended the story arc, it would have more of an impact on me. As it is now, I feel like not much thought was put into releasing this as a second chapter. Perhaps the powers that be wanted to rush this serial along. In spite of all that, this comic was good, solid and entertaining. I'd still recommend this in spite of my misgivings about its format. Art - 5: The panel with Superman looks rushed, but that really isn't enough to give the visuals a lower rating than they deserve. I love Steve Pugh's art. I've been a fan of it for a long time, since his Hellblazer days. I especially loved his rendition of Grundy. It makes me hope Pugh will do the Hulk for Marvel. There's awesome art contained in this book. Cover Art - 5: The cover is pretty typical of this series. Yet, that isn't a bad thing. In fact, I found this to one of the best cover images on recent DC comic books.